Are your shoulders hunched and rounded? Is sitting up straight becoming a chore, creating pain and stiffness? Stress, whether acute or chronic, can impact your breath and consequently your health. Parkland due to Open end of September 2018! Momentary excitement walking down new stairs - but Public Park still not open!! Extension of the licensed hours of Shop 7 from 10-10 7 days. To 10am-midnight M-S.
Should Harold Park remain a part of Forest Lodge? The Development Assessment Sub-Committee decided that consideration of this matter be deferred to the meeting of Council on 7 April 2014. Traffic Impacts of Major Retail Development at Harold Park - Not too Late! The revised proposed retail development at Harold Park includes 145 (exceeding 125 limit) car spaces and an upgrade of roads and bridges through Annandale foreshore parkland to acces them. This traffic, along with that generated by the large residential development at Harold Park will add to the congestion on the Crescent and impact public transport along the route, which also needs to be increased to meet the obvious increase there will be in demand from the residents of the new development. At their April 7 meeting, the Sydney City Council may refuse the DA or approve it with ineffective conditions of consent (see alternative motion here). The Council meeting to consider the DA is open and the public can attend. It is item "9.9 Development Application: 10 Maxwell Road Forest Lodge – Tram Sheds on the Agenda", but items which have drawn a large public attendance are brought forward. 1. Relocation of internal car park from Level 1 to Level 2 and new ramp. 2. 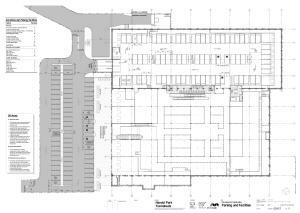 Relocation of supermarket from Level 2 to Level 1 including reduction in gross floor area of supermarket from 2700sqm to 2345sqm. 3. Reconfiguration of internal retail tenancies. 4. Increase in bicycle parking spaces from 50 to 84 and increase in vehicle parking from 142 to 145 spaces. 5. Additional fire exit to Maxwell Road. The City of Sydney has received the above Development Application. As part of the assessment process, we are notifying surrounding neighbours and property owners to seek their views on the proposal. 1. Online at the City's website www.cityofsydney.nsw.gov.au, under Development - Development Applications - On Exhibition. The website contains all relevant details of the proposal, including plans, which can be downloaded if required. A submission can be made directly from the website. CBD Level 3, Town Hall House, 456 Kent St, Sydney. Mon to Fri 8am - 6pm. GLEBE Customer Service Centre, 186 Glebe Point Rd, Glebe. Mon to Fri 9am - 5pm. The Lord Mayor will open the event and you can view the design plans, speak with the project team and provide your feedback. The developed design will be on public exhibition from 3 – 23 March 2014. When: Monday 3rd March, 5.30pm – 7.30pm. (a) The hours of operation are restricted to be between 7.00am and 9.30pm Monday to Sunday to vehicles servicing the site. (c) The restriction on hours is to be included in the updated Car Park Plan of Management. (c) 2 spaces dedicated to motorcycle parking. (i) Detailed design drawings consisting of a road design plan, illustrating road design dimensions (e.g. lane widths, median widths, swept paths etc. ), including appropriate provisions for pedestrians and cyclists. The plan shall be to scale. (ii) The removal of any on-street parking spaces required as a result of the proposed intersection upgrade will require community consultation with affected residents and/or businesses and shall be undertaken by the applicant to the satisfaction of the NSW Roads and Maritime Services. (iii) The upgraded facility provided prior to the issue of an Occupation Certificate. (a) Subject to the receipt of permission of the affected landowner, dilapidation report/s, including a photographic survey of the bridge over Johnston’s Creek, approaches and adjoining stormwater channel are to be prepared by an appropriately qualified structural engineer prior to commencement of excavation works. A copy of the dilapidation report/s together with the accompanying photographs must be given to the above property/asset owners, and a copy lodged with the accredited certifier/Certifying Authority and the Council prior to works commencing. A report on the application will be submitted to the Planning Development and Transport Committee meeting on 3 December 2013 for determination. This meeting is to be held in the Council Chamber of the Town Hall commencing at 5.00p.m and is open for public attendance. Project team discussing refined Master Plan and seeking endorsement at Environment Committee meeting on Monday 19 August 2013 at 2pm. Team will then seek Council endorsement of the refined Master Plan. The business papers are now live on the City's website. They include phase 1, 2 and 3 consultation reports, a summary from phase 3 of community comments and responses from the project team, the amended Master Plan, a location plan and a number of precedent images. These can be viewed online at http://www.cityofsydney.nsw.gov.au/council/about-council/meetings/calendar-and-business-papers/2013/august/environment-committee (scroll down to Item 8). Link from Maxwell Road and Jubilee Park Light Rail Station. No mention of access from Harold Park residences or impact on pedestrian access to Jubilee Park Station from Annandale and Forest Lodge. Harold Park, was the third European name given area. The first name was Lillie Bridge after the English Running Grounds. However the stench, subsequently associated with Lillie bridge, led to its second name, Epping. This 1907 Plan of the third sub-division of the Toxteth Estate shows the "Epping Recreational Ground" and Tramline. Harold Park, NSW is bounded by Johnston's Creek, the Crescent, Minogue Crescent, Wigram Road and Toxteth Estate. Latitude:33.87°S, Longitude:115.18°E. Harold Park on the Web © Ramin Communications 2012. Contact Ramin Communications regarding reuse of any content from this website. This page www.ramin.com.au/harold-park/history.shtml last updated 7 November 2018.